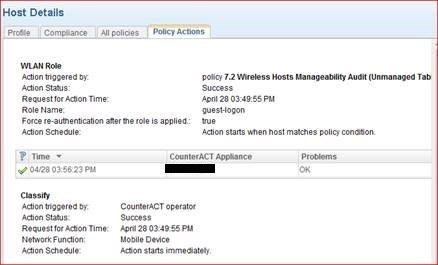 Recently, I tested out policy enforcement on corporate iPads using Forescout’s CounterACT and its optional Airwatch integration module*. I’ll be sharing a few things I learned along the way, especially since documentation of this setup is rather sparse (read practically non-existent). To get this setup, I installed the Airwatch module, downloaded from the Forescout site. You’ll need a valid login, but once you’ve downloaded the file, you can install the module from the CounterACT client by going to Tools -> Options -> Plugins. After installing the module, there’s a few pieces of integration information that can be found in the Airwatch portal itself. In the CounterACT client, you can right-click the AirWatch MDM plug-in, click Configure, and enter the required information. Once you’ve completed the integration information, be sure to start the AirWatch MDM Plugin – it doesn’t automagically start and results are particularity disappointing unless it’s running, as I experienced myself. At this point it is a good idea to use the Test option for the Plugin and confirm you see a Test Passed in your output. You can also double click the MDM Integration Module and you should see some happy little Airwatch managed devices listed. Now it’s time to set up a couple of policies. 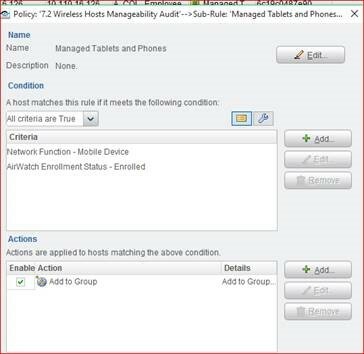 My first policy matched on Network Function – Mobile Device and Airwatch Enrollment Status – Enrolled. If CounterACT finds these two criteria to be true, it should drop the tablet into my Corporate Hosts group I designated – a group which is allowed the appropriate network access for a corporate managed device. My second policy was designed to match unmanaged tablets and phones – those not enrolled in Airwatch. 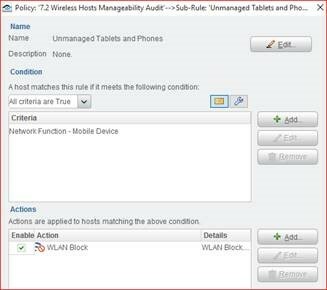 The policy checks if the Device Function is Mobile Device, and has an action of WLAN Block. I thought this would be it and victory would be mine, but alas the WLAN block wasn’t working. I received increasingly annoying errors about not being able to reach the wireless controller to enforce the policy. After testing the wireless controller under Plugins, I could see I was failing on WLAN Role and on Write Permissions. In an act of sheer grasping at straws, I removed the wireless controller, which had been added as it’s VIP (HA) address, and instead added the wireless controller as its “real” IP address. That did the trick. All tests passed, victory dance cued up. But then I discovered the extremely disturbing flaw in my perfect policy plan. Once a device was identified as not managed and very successfully blocked, it became blocked from all SSIDs. 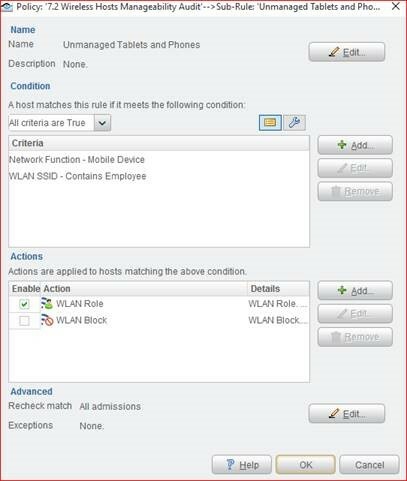 Meaning no employee network AND no guest network for the device. The controller wouldn’t accept the device as a client. Period. Cue sad trombone instead. Reworking the policy logic, I instead implemented the WLAN Role change instead of the WLAN Block action. I selected a guest role configured in the Aruba controller that locks the user down, blocking access to corporate resources. You can see below the successful policy enforcement. Later, my awesome coworker was able to set up an HTTP notification action for the policy so that the users see a web page informing them of the error of their ways and instructing them to change SSIDs to the guest wireless network to be redeemed. *Anyone who has had to deal with 802.1X certificate enrollment for iPads knows what a PITA the experience is – the setup being tested here allowed for PEAPv0 (EAP-MSCHAPv2) authentication using Microsoft NPM, with the goal that any non-corporate device would have no access to corporate resources. There are other ways to skin this ugly iPad certificate cat, and if you’d like to list the ones you’ve had the most success with in the comments, I am sure others would appreciate the insight. Studying for CWAP, I embarked on a mission to capture 802.11 management frames using my Windows laptop. For those with MacBooks that do this natively, read no further, just keep on perfecting that smug look of disdain with a slight hint of pity for the rest of us Microsoft peasants. For those whose laptops aren’t fruit branded, but you still want to capture 802.11 frames in promiscuous mode, this is the post for you. Especially if you can’t quite justify the cost an AirPcap adapter for study purposes. While researching alternatives to pricey AirPcap adapters, I came across this Acrylic WiFi Professional post on their option for an NDIS driver. This driver allows you to capture in promiscuous mode, so you can capture all that management frame goodness, but without the AirPcap adapter. I checked out the supported USB wireless options, ordered one off the list from Amazon (I picked the NETGEAR A6200), and downloaded a free trial of Acrylic WiFi Pro to get started. The installation of Acrylic Pro is straightforward, as is turning on Monitor Mode when you know where to look. By default, Monitor Mode is turned off and the NDIS driver is not installed. Just click the menu in the right corner, and select Change to get to the Monitor Mode settings. Select Monitor Mode On and select Install the NDIS driver. You’ll get a warning message that you might crash your system and you’ll need to acknowledge that you are completely okay with this*. Once the driver is installed you can swap over to the Packet Viewer using the icon in the top tool bar or by clicking Packet Viewer from the menu. You will also see that you are in Monitor Mode and can select to change out of Monitor Mode if so desired. While all of this is really super cool, I was extremely interested in capturing these frames inside of my most familiar tool of packet sniffing choice, Wireshark. Unfortunately, I didn’t see the NDIS driver as an available capture interface when I launched the Wireshark application. This post by Acrylic reminded me why. I needed to launch Wireshark with Run As Administrator, even though I am a local administrator on the laptop**. Once I did this, I could select the Acrylic NDIS NETGEAR A6200 WiFi Adapter and start capturing wireless management frames. I could also select the Wireless Toolbar in Wireshark and see that the NDIS driver emulating an AirPcap adapter. Unfortunately, I still had one tiny problem at this point. Every time I launched the Wireshark application, my built-in wireless card immediately quit passing all traffic. Not exactly ideal for productivity. Easy fix, though, if you encounter this issue. 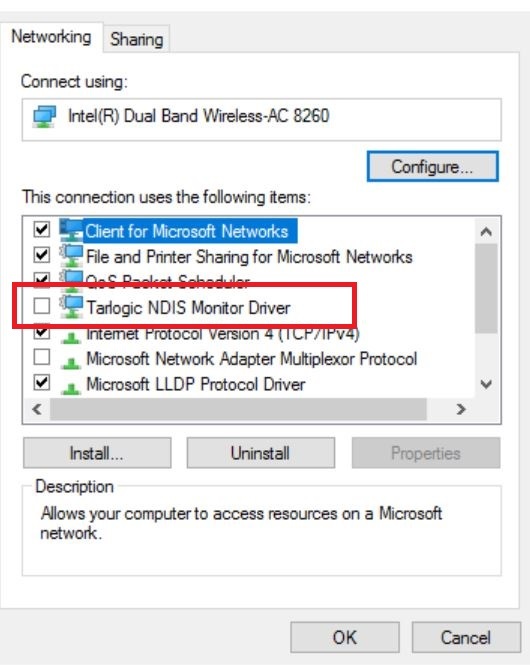 Head over to the settings for the Network Adapter, uncheck the Tarlogic NDIS Monitor Driver for the built-in adapter, and the problem is solved. I would be remiss not to point out that there are limitations to this NDIS driver. For instance, there is no support for 40 or 80 MHz channels at this time. But for my CWAP study purposes, this is working quite well and saves me a bit of cash. Also, Ben Miller did a great write up on this very same subject, which, of course, I found just AFTER I went through this process and drafted this post. The universe has quite the sense of humor like that. **If you need to know how to set a program to always run as administrator in Windows 10, look here.